I think I may have mentioned before that I’m writing up some poetry units for the Australian Curriculum? I am beginning to doubt that they will ever be finished, because as fast as I finalise a lesson on the units I’ve done, somebody produces another gorgeous book and of course I have to use it, and so my unit is out of date five minutes after I’ve planned it. 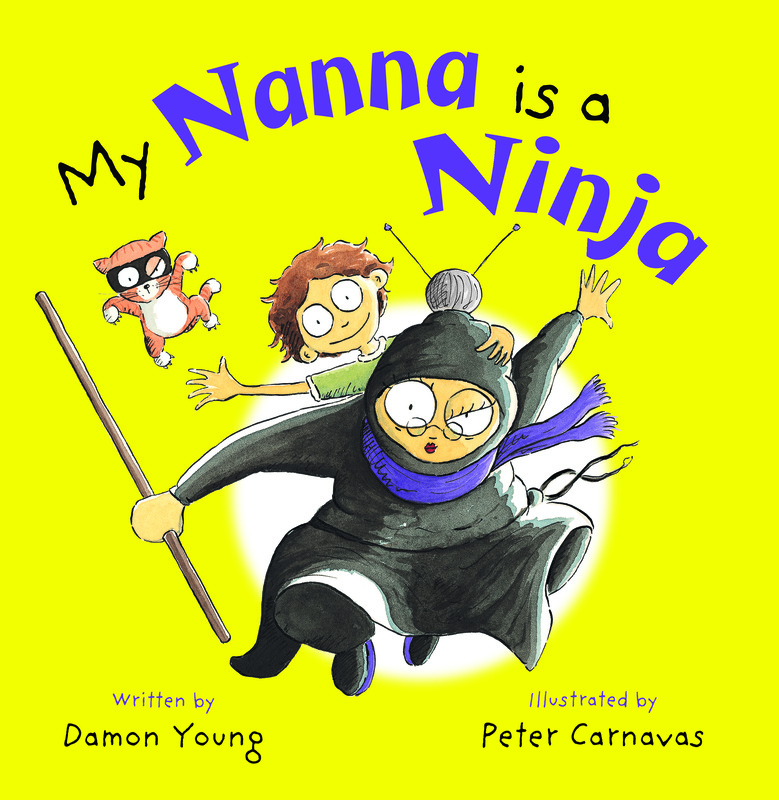 So it is with this fabulous book from Damon Young: My Nanna is a Ninja is hilarious – I can’t wait to use it with my Year 4 poetry class. Some nannas dress in blue while they bake sweet apple pies. Some nannas dress in red as they fly about the skies. Some nannas dress in pink while they jog around the track. But my nanna is a ninja so she dresses up in black. These four nannas defy stereotypes: they are young, or young-at-heart, they are all active and they all express their love for their grandchildren in different ways. The illustrations work with the text to show us a grandma ballooning, riding on wild horses, and otherwise living life to the full. The ninja grandma sneaks out for midnight feasts, and uses a ninja sword as a satay stick for eating watermelon. I’m going to use this book to explore rhythm and rhyme, but I don’t think we’ll try to emulate it in our own poems. Too hard! We’ll talk about other forms of poetry that we could use to write about grandmothers so that we focus on meaning. We could try acrostics, maybe haiku, or free verse: the important thing will be to capture the mood of individuality that modern grandmas have, and the special relationship that they have with their grandchildren. Night Monsters is another of the NLA’s picture books which can be used to teach young children about Australian animals. She was glad it was finally light. Of monsters in the night. And put their fears to rest. Waddle Wombat hears a witch making her teeth go ‘clack’; Rowdy Roo hears hissing; Ernest Echidna is sure that there’s a dinosaur snarling; and Doris Dingo hears growling and grunting that she thinks is a bear (which most Australian children will know couldn’t possibly be, in the Australian bush). Wallis Wallaby is worried about the beat of a dragon’s wings; Paddle Platypus thinks that a goblin is snoring; and Prunella Possum says she’s seen a giant roaring. But Cackle Kookaburra knows what’s causing all these spooky noises – it’s Larry Lyrebird, a remarkable mimic! All’s well that ends well, and the last page of the book features facts about the lyrebird, complete with some images from the NLA’s collection, some of them very early ones from the 18th century. The rest of the pictures are bright and lively full colour illustrations by Cheryl Westenberg, who also illustrated What’s Dad Doing? which is a very popular book in our school library. (See my review). The book is produced on high quality paper, with a cover that is more robust and durable than most paperbacks, giving it a longer shelf-life in a school library. 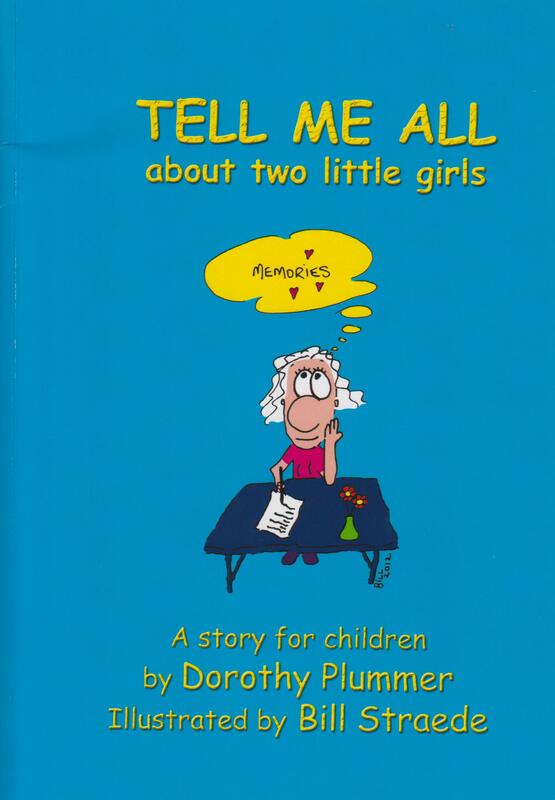 Tell Me All, A Story for Children is the latest in a series of rhyming books by Dorothy Plummer. Dorothy’s previous titles, Tell Me, Tell Me; Tell Me Too; and Tell Me Please were anthologies of poems pitched at small children but this one is a story in rhyme. Held a cuddly blue teddy, and a muff with long strings. And dangling out back were her mother’s old pearls. That this girl was keen to put on a show. Wore far too much fancy paraphernalia. Despite the pearls and paraphernalia, Dorothy is an adventurous little miss, with a lively imagination. This book made me feel quite nostalgic for the days when kids played outdoors, and had the freedom to play more-or-less where they liked. Emerging readers will (with a little help) enjoy reading this book as a window on ‘the olden days’ and on the joy of enduring friendship. Disclosure: Please note that Dorothy is a friend of mine through the Mordialloc Writers Group. Source: review copy courtesy of the author. 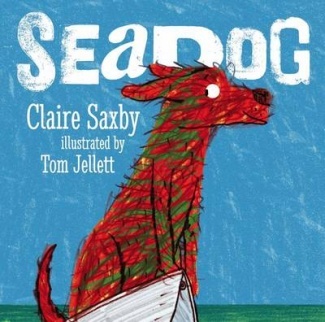 I am a complete sucker for picture books about dogs, but I especially like Seadog by Claire Saxby and Tom Jellett because it reminds me of a similar rapscallion from my childhood menagerie of pets. On hot days, my mother used to pick us up from school and take us to Brighton Beach for a swim. On one of these afternoons, we made the acquaintance of the dirtiest, smelliest, noisiest dog in creation, all alone and homeless. He was also very big, almost as big as the thieving Rhodesian Ridgeback we once had, that sabotaged friendly relations with all our neighbours. Anyway, somehow we squeezed him into the back of the Hillman Minx and took him home. I suspect that my mother was desperately hoping that the calls to the Lost Dogs’ Home would bear fruit, but she took it stoically when his (possibly relieved) owners failed to materialise. We named him Willoughby, and we loved him to bits, despite his penchant for rolling in the dirt and running away at bathtime. Until one day he jumped our tall front fence and we never saw him again. No doubt he found another family with whom to share his enthusiasms. He was that kind of street-smart dog. The illustrations by Tom Jellett are bright and colourful in cheery primary colours. I won’t be surprised if this title is shortlisted in awards this year. You know how it is: it happens to all of us sometimes. I was just back at work after a week off with a crook back and still feeling rather fragile, and of course I didn’t have a work program ready for my first classes. I needed to prepare something fast! I can’t tell you how grateful I was to Scott Eathorne from Quikmark Media for sending me this new collection of chant and rhyme books by the inimitable Peter Viska and Peter Durkin (much-loved by children everywhere for their naughty collection – Far Out, Brussel Sprout; All Right Vegemite and others). There are four books in the new series and Scott had sent me two sets, so I had enough books for 4 tables of 4-6 children. I told them that I wasn’t going to read them a story this week; I needed them to help me write a review of these new books. I showed them where the poetry shelves were in the library so that they could find the books next time, and I read them a few samples from each of the books. Of course they were delighted! I gave the children the books and some paper to write and draw on, and then a hush descended on the room, rising and falling with the murmur of children reading and laughing and sharing with each other. They loved these books, and there was a real sigh of disappointment at the end of the library lesson when we had to pack up. Many thanks to Areesh, Dania, Emma, Gavin, Seth, Sina, Taonga, Amar, Ameer, Daniel, Justin and Nadia for letting me share their work with readers of LisaHillSchoolStuff. This is the publicity blurb that came with the books, but I think the children’s work in the slideshow below it speaks for itself. Peter Viska’s understanding of children has rewarded him with a lifetime of publishing and TV success. His Far Out, Brussel Sprout! series has been printed over 40 times by three publishers in Australia and have sold in excess of a million copies. Now Peter is set to release a brand new series of four children’s picture books through Alicat Publishing that are packed with fun, irreverence and good time cheekiness.